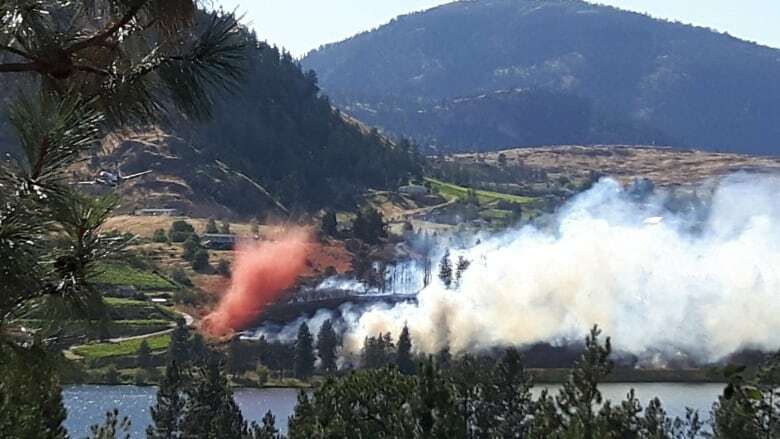 A fire in the Okanagan community of Kaleden threatened structures and caused the evacuation of dozens of homes on Tuesday. It broke out in the afternoon in the southeast area of the town, near Ponderosa Point. By the end of the day, 18 homes had been placed on evacuation order, centred along the 300 block of Oak Avenue, with 165 other properties on alert. But it appears as many as 100 homes were evacuated voluntarily or otherwise during the course of a hectic evening, with the fast-moving fire in a residential area causing a hasty retreat for many. "We hope that fates are with us. The winds don't come up. And that maybe some of the air crew are able to get some retardant down around the old girl and save our little place," said Marilyn Mulldoon, one of the many people who left their homes on Tuesday. The fire, 10 km south of the city of Penticton, is approximately 5.5 hectares in size and is not contained, according to the B.C. Wildfire Service. On Tuesday evening, all roads into the town's residential centre were closed. "There are structures that are threatened ... it started quite quickly this afternoon," said Max Birkner, fire information officer with the Kamloops Fire Centre. He said that with the fire danger rating high throughout the province, the public needs to be extra cautious. "What we're really asking people is to be seriously vigilant ... the last thing we need is multiple fires to occur due to people not being careful enough." "It's so dry. It's so tinder dry," said Mulldoon. "God only knows what's going to happen down there. We hope the fire department is able to contain it and the firefighter crews that are being brought in are able to do something." Penticton RCMP, the Kaleden fire department and the B.C. Wildfire Service are all on scene, and the Wildfire Service has 30 firefighters and five aircraft on scene. Crews couldn't immediately say what caused the fire or whether it had destroyed any homes. An emergency centre has been set up by Emergency Social Services for evacuees at the Penticton Community Centre at 325 Power Street. Anyone who needs to register can phone 250-809-6561.